PASCO utilizes this vehicle measuring technology to enhance efficiency and sophistication in road maintenance and management work. In this way, PASCO provides support for optimizing lifecycle costs and extending the lifespan of social infrastructure. The use of MMS in road condition surveying (roads, structures, facilities, exclusive use) reduces exclusive road use time in site operations, and enables the acquisition of 3D data for roads and their surroundings in an efficient yet low-cost manner. Through this technology, it is possible to gain an accurate and detailed understanding of the current situation. With MMS, it is also possible to draw up a photographic image of roads without vehicles, which is difficult when using aerial photographs. While it is difficult to determine the specific location of road markings and road appurtenances (lighting, sound insulation walls, guardrails, manholes, telephone poles, signboards, planted zones, road signage, road information management facilities, etc. 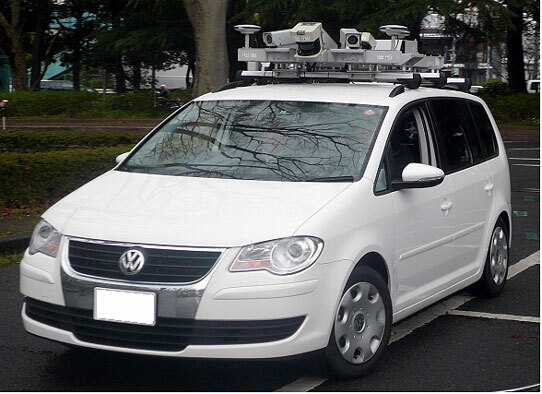 ), it is possible to determine location and obtain accurate location information by assessing the images of the environment around roads and 3D point group data obtained via the MMS. The information on road markings and road appurtenances is used as a road database, and plays a useful role in the establishment of a comprehensive maintenance and management system for road infrastructure. It is possible to draw up vertical and horizontal cross-sectional diagrams of an arbitrary point using the 3D point group data obtained using MMS. 3D point group data that is obtained through laser irradiation from below structures such as bridges can be superimposed, and utilized in 3D designs and informational construction. *Relative height precision is a machine precision specification for the laser device, and is not a marker of how precise the measuring results are.